Discussion in 'JS Plugin Releases (RMMV)' started by Galv, Mar 15, 2016. Another port of my ACE version. 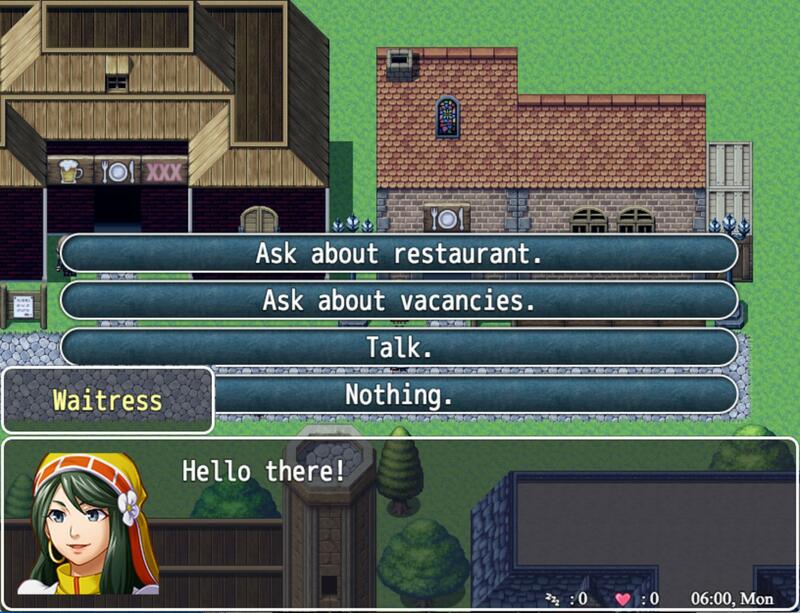 Visual Novel Choices now in MV. 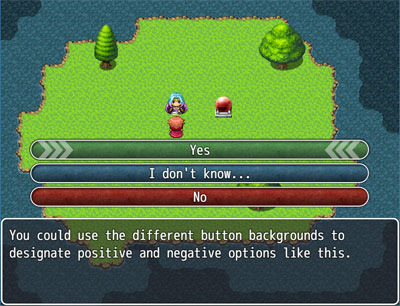 Pretty simple - changes the default "Show Choices" menu to look like a visual novel choice selection.Uses a graphic that contains multiple choice backgrounds that can be used on individual choices. 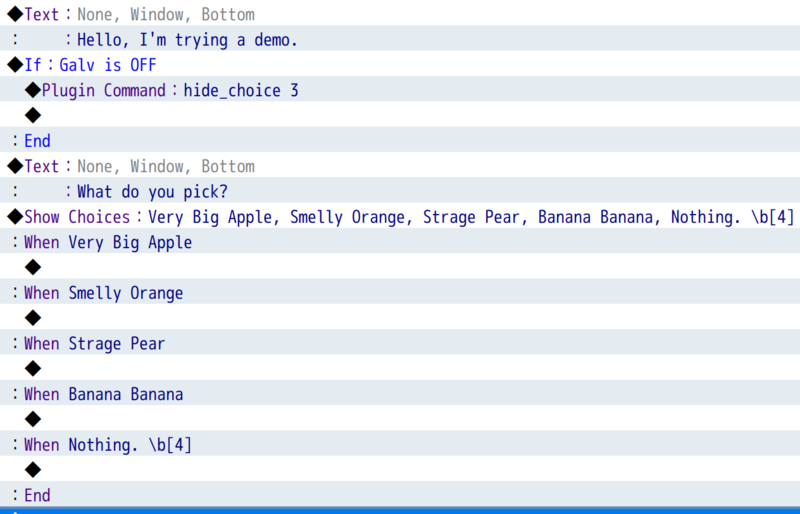 - Copy the "GALV_VisualNovelChoices.js" file into your project's /js/plugins/ folder. - Read the help file and examine the demo to learn how it works. 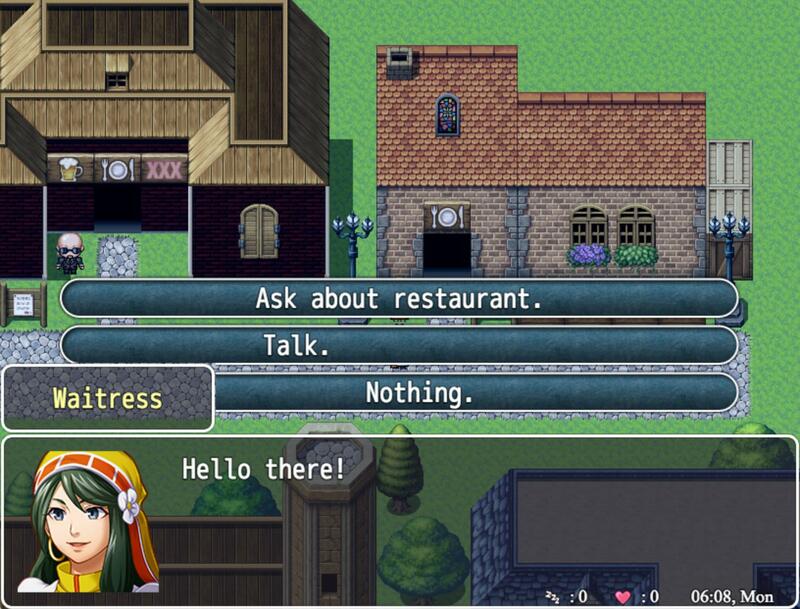 Free to use in any RPG Maker MV project including commercial. Please credit "Galv". 2016-05-11 - Version 1.4 - required image will now not be removed with "exlude unused images" deployment option. Dreadshadow, cji3bp62000, SpacemanFive and 14 others like this. Nice, way prettier than the default. I've been waiting for this one for a long while! And this looks even better than the original! Good job with your plugins as always! Out of curiosity: Do you think this is compatible with Tsukihime Hidden and Disabled Choice Conditions? Just wondering if there would be any way to visually show disabled choices. I edited the VNButtons.png to include a grey background to indicate a disabled choice, but I don't think there's currently a way to change the background automatically, is there? I ask because most of my disabled choices are due to variable / switch differences, e.g. If relationship is too low, can't do choice x. So the grey-ed backgrounds would change based on the variables changing. Another thing is that it overlaps with the message name window, but I'll probably just go back and delete the name windows before each choice so that doesn't happen. I mean, it's a lot of work but I really like your choice windows! I don't know if I make sense, but anyway, tl;dr, I'm really loving how much prettier this looks over the default choice windows, so thank you! Galv and Ilan14 like this. Oooh! Does also work with the Conditional Choice Text plugin? Ahh, I did not think of name boxes or anything. An option to move the choices away from that is a good idea - adding to my to-do list. That would be really cool, thank you! That's the Disabled choice plugin, and there's a link in the first post to the other choice-related Plugins (including the ones that Ilan14 mentioned) like large choices, conditional choices etc too. Updated to v.1.1 - added setting to control gap between message box and choices. Lemme know if any issues. Ilan14 and Veralisa like this. I just added v1.1 to my project and both the disabled choice and message gap features work great! Thank you so much for the update. Something minor I was thinking of pointing out is that if a user also has Hime's Hidden Choice plugin (where choices are hidden based on conditions), the centring of the text seems to be off. Here's an example of the off-center, and here is the same event when the choice isn't hidden (the condition is met). This update is really great, Galv! 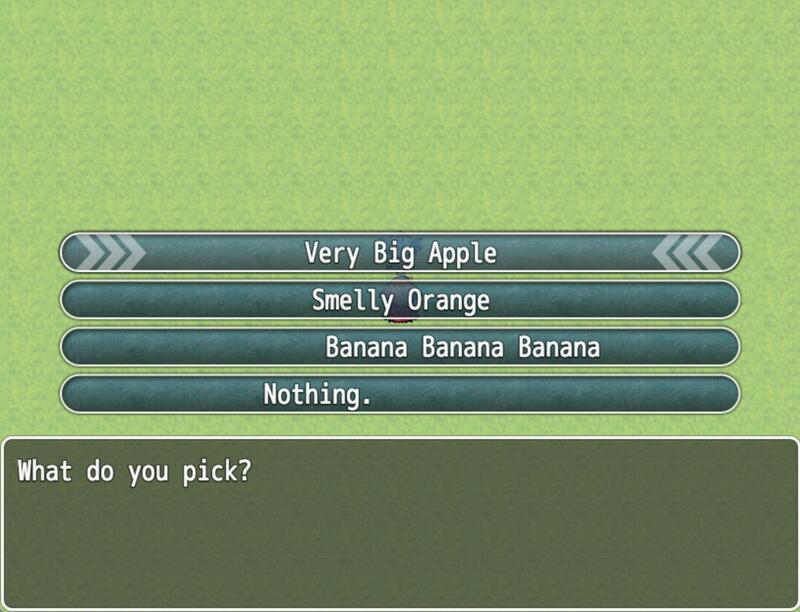 Oh, and by the way, the issue that Versalia mentioned before also applies if you're using Tsukihime's Conditional Choice Text Plugin. Oh? I didn't see it happen while coding the update. Can you please try changing their positions in the plugin list? I put your plugin above his plugin, I disabled the Disabled and Hidden Choice Condition plugins, and the same thing still happens. Hmm, I have both of Hime's plugins under my plugin and everything is working fine - I don't have text alignment issues. Please try what you are doing in a new project or copy/paste the lines of text in your choices so I can try and replicate. I looked more, and it seems that with the Conditional Choice Text, the centering of the text fails if I change the text of the choice using a script call. Otherwise, it's fine. But the Hidden Choice Conditions plugin still unaligns text when used normally. Please see if it happens in a new project. Please copy/paste the lines of text in your choices so I can try and replicate. As for changing choice text using script call - what script call are you using and are you using a plugin to do that? Made a new project with no plugins other than Galv Visual Novel Choices and Hime's Hidden Choice plugins, and the error still occurs. Here's a screenshot of the off-center in game. Without the plugin command, the color and the centering is fine. Edit: I don't use conditional choice so I didn't add my experience with that, sorry, but if you want me to I'll get it and try the same thing! Fixed alignment when using color codes. Is now compatible with Hime's choice plugins. It works much better now! Thanks for the update!